When you call Stevenson & Sons Funeral Homes, we’ll immediately start to assume the burden of all the details and arrangements. Since 1962, three generations of the Stevenson family have been deeply involved in the lives, and deaths, of our friends and neighbors in southeastern Montana. Over the decades we’ve learned many things, but perhaps none is as profound as the significance of the funeral service. This final opportunity to pay tribute to the passing of a loved one honors and celebrates the deceased in the most personal of ways, while providing family and friends with a very necessary opportunity to share and lessen their grief. Funerals are not merely rituals for the passing of a loved one, they are the deceased’s final gift to family and closest friends. At Stevenson & Sons Funeral Homes, we are fully dedicated to helping families create a funeral that is as unique and meaningful as the life it honors. In over half a century of service, we have gained the experience necessary to help create funerals that truly express the wishes of the family, while paying dignified tribute to a life lived. 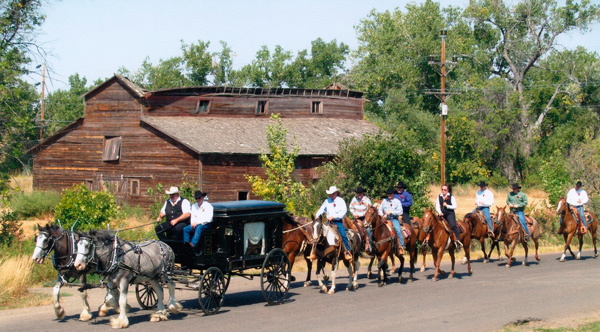 Montana funeral processions often include family members riding horseback behind the horse-drawn hearse. In an effort to support the funeral needs and wishes of families, Stevenson & Sons has been an innovator. In 1981 we had our first funeral procession lead by a team of majestic Clydesdales pulling a 1890’s horse-drawn hearse carriage. The hearse is uniquely fitting to our Montana culture and heritage. 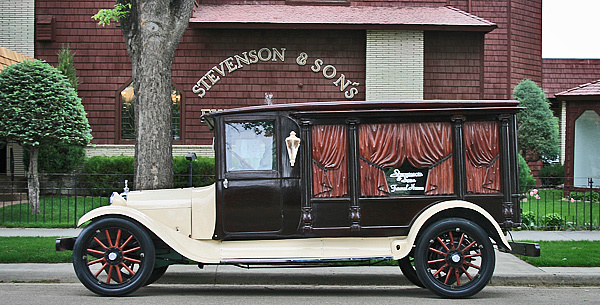 We also have a beautifully restored 1920’s period hearse, for those wishing to add a notably nostalgic element to the funeral procession. Over the many years, Stevenson & Sons Funeral Homes has orchestrated some very unique memorial services. When you call Stevenson & Sons Funeral Homes, we’ll immediately start to assume the burden of all the details and arrangements. We genuinely know how difficult and stressful times of loss are, and we are utterly committed to helping family members and friends remain free of coping with tedious necessities so that they may mourn their loss without unnecessary encumbrances. Call us any time of day or night, weekends or holidays – and allow us to instantly start making appropriate arrangements so that you can focus on what’s most important. Listen to Dr. Alan Wolfelt describe why it’s important to have a funeral. Is a formal or informal ceremony or ritual prior to burial. A funeral service provides an ideal platform for the closure of family and friends. Although your faith or culture may dictate some of the elements of a funeral service, it is customary to personalize other elements of the service. At a funeral service, a casket or urn is present. You may choose to have the casket either open or closed. Customarily held the night before, or immediately prior to, the funeral service, the visitation – also called a wake or a viewing – provides a way for friends and acquaintances to pay their individual respects and offer their condolences to the family. As with the funeral service, you may want to decide if you want an open or closed casket; should you wish one to be present. At a memorial, or tribute service, a casket or urn is usually present. Otherwise similar to a funeral or visitation, a memorial service gives family and friends a time to come together and celebrate the memory of the deceased’s life. A graveside service is held at the gravesite just prior to the burial of the casket or urn. This final service usually consists of a eulogy, final remarks, prayers or in memoriam sentiments. This service may, in certain instances, occur after, or in place of, a funeral service. There is no better way to honor military service to our country than with the inclusion of Military Honors. The ceremony begins with the draping of Old Glory over the veteran’s casket. At graveside, military Guards of Honor fire a volley of shots known as the gun salute. Taps, also known as “Butterfield’s Lullaby” or “Day is Done,” is played. The flag is ceremoniously folded and presented to the family as a lasting memento of the deceased’s service to his or her country. The Military Honors are provided by our local Legion Clubs and VFW Service Clubs, as well as the National Guard. Representatives are also sent by the Army, Air Force, Marines and Navy, as necessary. Like all Americans, the Stevenson family and the staff of Stevenson & Sons Funeral Homes owe a great debt to our country’s veterans for their past and present service to our nation. It is with this debt in mind that we always provide veterans with the very best Military Honors possible.